When Despicable Me 2 arrived in theaters this past summer, Universal had to be pleasantly surprised that the film became the number one comedy of the year, banking $863 million globally. 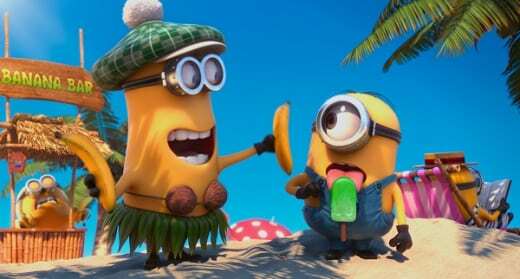 Sure, we love our Minions (a Minion movie is coming! ), but that’s a lot of Minion money! The Steve Carell-starring animated film has arrived on DVD and Blu-Ray, and it is one smartly packaged home video release as it contains more Minion material than even the biggest fan can imagine. 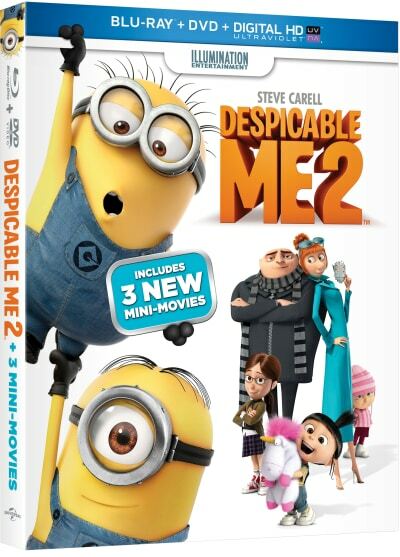 The Despicable Me 2 DVD and Blu-Ray are truly Minion mania incarnate. Despicable Me introduced Gru (Carell), the world’s greatest villain, and his minions and showed how he would go to the ends of the world to achieve world dominance -- even if it meant adopting three adorable little girls as a means to get into his rival villain's home. What he never counted on was that the trio of little ones would steal his heart. And they stole audiences’ hearts as well. Despicable Me 2 was immediately green lit, and the story finds Gru being recruited by a secret government agency that wants to use his villainy expertise to capture someone who appears to be on the verge of becoming what he used to dream of being, the world’s best villain. Gru is recruited by Lucy (Kristen Wiig, in an astounding turn) and the two join forces to find the evil that lurks in Gru’s community. As we stated in our theatrical Despicable Me 2 review, Carell and Wiig create impeccable comic (and hilariously romantic) chemistry, and it is just one facet of why this film works so well. The other part is… you guessed it, the Minions! Knowing our complete and utter adoration for all things Minion, Universal Home Entertainment has given fans a fantastic holiday gift of three new mini-movies. The three mini-movies are introduced by their master, Gru, and are entitled Puppy, Panic in the Mailroom and Training Wheels. If these short masterpieces are an indication of what we can expect from the upcoming Minion movie, we are all in for a treat. We particularly like Panic in the Mailroom as it ties into the plot of Despicable Me 2 and the fact that our beloved Minions can turn evil… purple and evil, but evil nonetheless. The making of the mini-movies is also an added bonus feature as it shows off the talented artists and voice talent who are bringing the Minions to life. The bonus feature The Minions is a delightful and intimate look at the making of the little creatures as cameras go to Illumination Entertainment headquarters in Paris and Los Angeles to take audiences behind the scenes of the magic that is their entire existence. Speaking of “evil” Minions, Evil Minions is a bonus feature that shows off how creators thought of the plot twist, as well as what it took to turn our adorable animated beings into the scenery-chewing monsters they become in Despicable Me 2. Not to be left out, as Despicable Me 2 is still his world, A Gru-Some Transformation is a fantastic bonus feature that has a never-before-seen interview with Carell as he discusses how he took the international super-villain to super dad and then to super-spy in the latest Despicable Me film. The featurette El Hombre Malo: The Villainy of El Macho shines the spotlight on our villain and the man who brought him to life via his killer voice talent, Benjamin Bratt. And like any good spy movie, Despicable Me 2 has its share of gadgets. Some are hilarious and some are quite functional. The documentary Gadgets Galore takes a look at the magnet ships, lipstick tasers and jelly guns that bring a bit of Bond to the world of Gru.